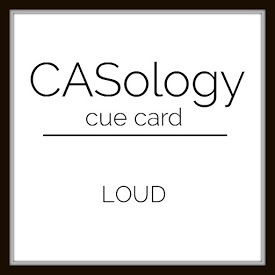 Loudness can be subjective so I think one could go in a number of directions with this cue word. 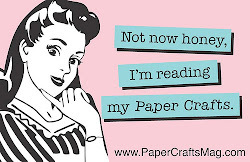 I thought about airplanes, my cat's purr (really loud when it's right in your ear at 1am!) and bright (or loud) colours amongst other things but in the end I went for loud music using this fun set from Paper Smooches along with Lil' Inker Designs sentiment. I also broke out my Hero Arts inks which haven't seen the light of day in a while. It was fun to rediscover them! 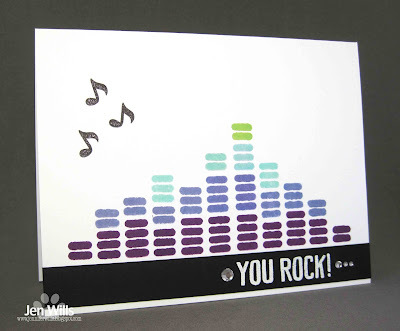 Your card rocks! Thanks for having me as your GDT! I think your choice for the cue word is perfect, and I particularly like the colours you chose. Great card Jen! What a FUN take on the cue word, this is cool Jen! OH you CLEVER girl!!! Just amazing, and fun! Great idea, Jen. Sometimes the walls shake when kids go by with their bass turned up loud. Send this over my way...and I'll give it to one of my boys asap. Perfect. Yep, this is the perfect card for the cue word. Awesome! Great card Jen, I like the musical notes, I agree Loud is subjective ;) but I am with you re: the loud kitty purrs! !